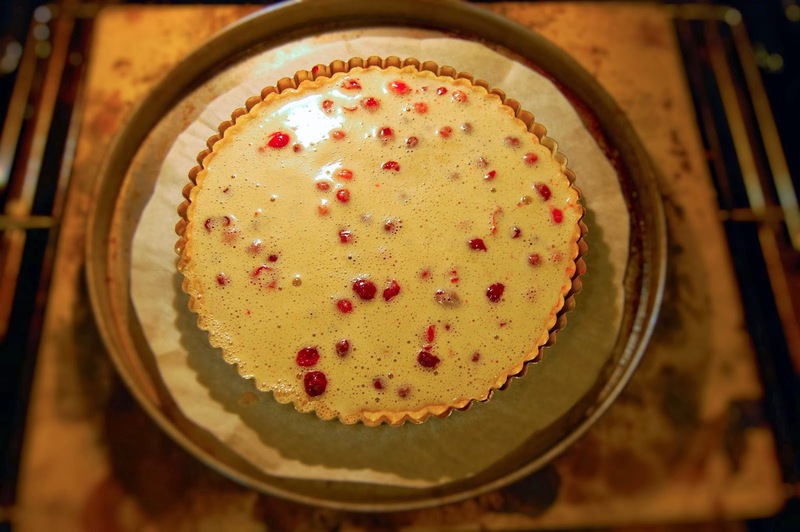 Snowy Cranberry Almond Tart | We Like to Cook! This quasi-French, frangipane-style tart reflects not only the flavors, but the colors of the holidays. Served warm, a slice of tart with a scoop of vanilla or cinnamon ice cream makes an ideal Thanksgiving dessert. 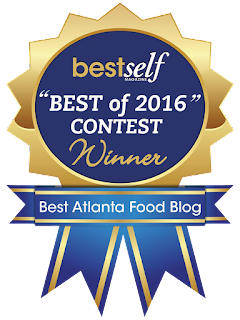 The color of the red berries and snow-like dusting of powdered sugar also make it a beautiful addition to your Christmas dinner table. Frangipane is a classic European pastry filling made with almonds, butter, eggs and sugar which is traditionally topped with pears or apples. 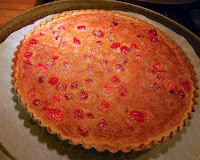 As the tart bakes, the filling puffs up and surrounds the fruit. Because they need to be softened and sweetened slightly, the cranberries are first candied in a sugar cook separately. 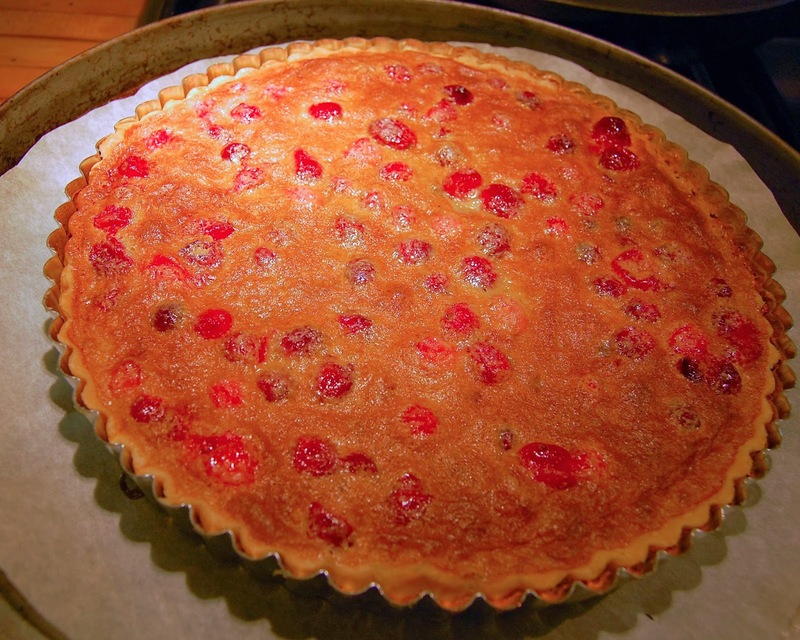 The snappy tartness of the cranberries is the perfect foil for the rich, sweet frangipane. A dusting of confectioners' sugar and a dollop of lightly sweetened whipped cream cap off this tart that is literally bursting with flavor. In a standing mixer fitted with the paddle, beat the butter with the sugar at medium speed until light and fluffy, about 3 minutes. Add the egg yolk, vanilla and salt, scrape down the side of the bowl and beat at low speed until smooth. Gradually add the flour, beating until the dough just forms a ball. 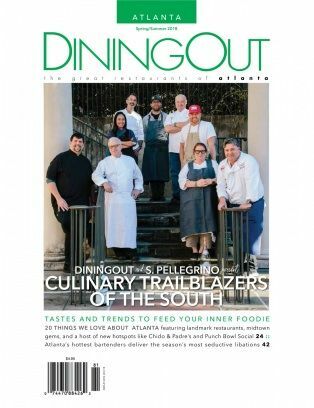 Pat the dough into a disk and cover with plastic wrap. Refrigerate the dough for at least 1 hour or overnight. In a medium bowl, beat the eggs with the brown sugar and flour. Whisk in the half-and-half and the almond extract. 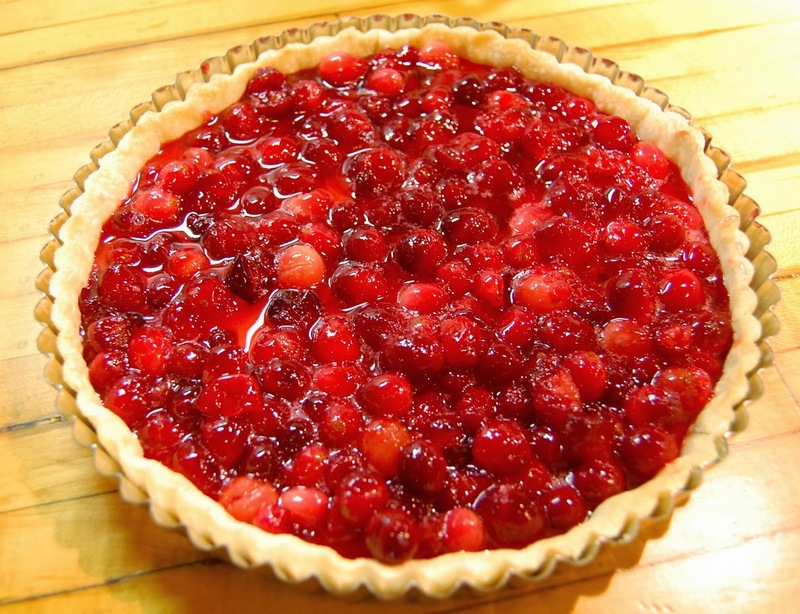 Spread the cranberries in the tart shell. Drizzle 1 tablespoon of the reserved cranberry syrup over the cranberries, and then pour in the almond custard. Bake the filled tart in the lower third of the oven until a skewer inserted in the center comes out clean, 16 to 18 minutes. Transfer the tart in the pan to a rack to cool completely, at least 2 hours. 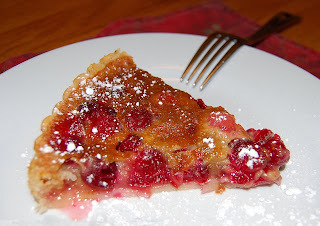 Dust the tart with confectioners’ sugar. Cut the tart into wedges and serve with whipped cream.